Manuel Aguirre created a series of paintings on emotions. William Gunderson created marketing and branding for his own NFL team. José Motta developed the marketing and branding for a fictitious brewery. Desiree Salpietro-Gigl illustrated a children’s book that she wrote. 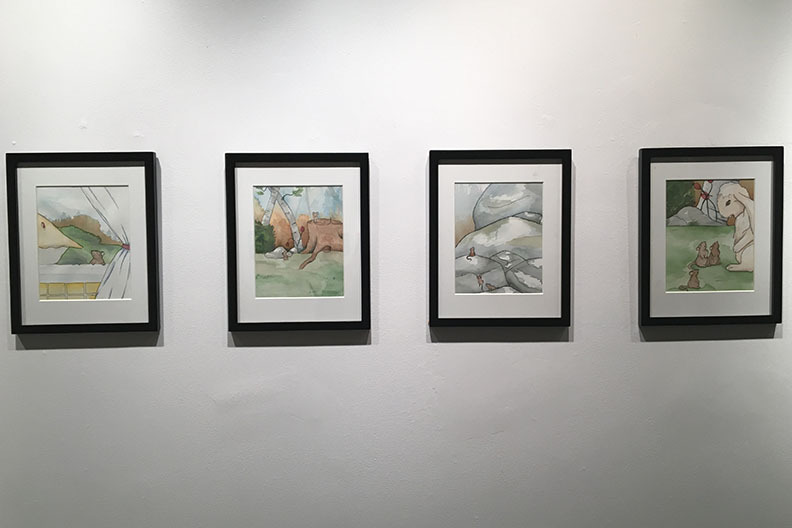 Emotions triggered by storytelling, visual branding for a new NFL team, marketing materials for a brewery, and bringing a children’s story to life are among the ambitious projects Elmhurst College seniors tackle in the Art Department’s 51st Annual Fall Capstone Art Exhibition. Four senior art majors are showing their work in the exhibition, which runs through Dec. 15 in the Barbara A. Kieft Accelerator ArtSpace. The culminating event for every graduating art major, the capstone exhibition requires students to create a body of work in their area of concentration, then plan the exhibition and design the promotional materials for it. 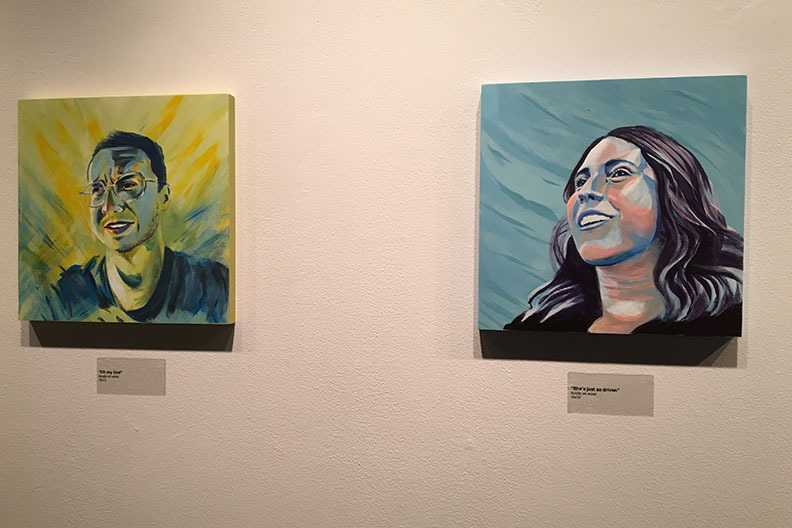 Manuel Aguirre, an art education major from Arlington Heights, painted a series of portraits based on his subjects’ emotional response to a story and conversation about it. “Every choice made while creating each portrait is a conscious effort to personify the emotion being expressed by the interviewee,” he said. 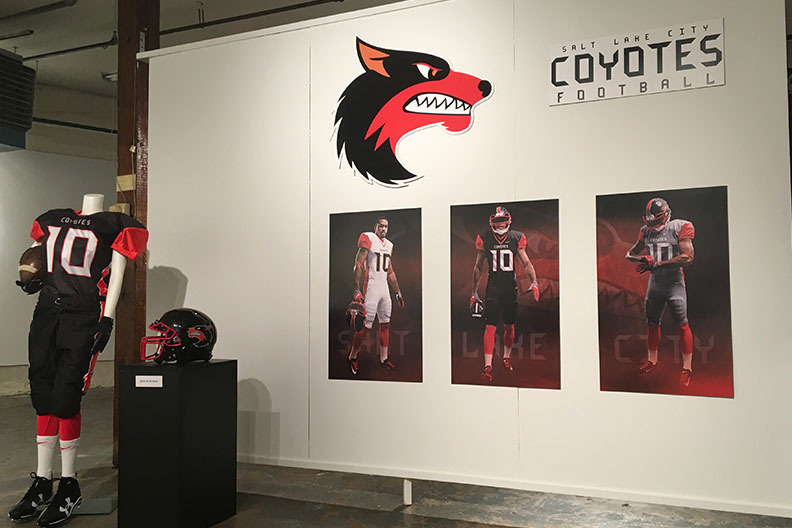 William Gunderson, a graphic design major from Allen, Texas, drew on his experience as an athlete, and his ability as a graphic designer “to create new identities,” for his project—marketing and branding for a new professional football team. After studying the branding among teams in the National Football League, Gunderson designed everything for his team, from the mascot to the typeface and uniforms. Inspired by his real-life passion for craft beer, José Motta, a graphic design major from Elk Grove Village, developed the marketing and branding for a fictitious brewery. The project is a perfect complement to Motta’s hobby of seeking out rare craft beers throughout the Midwest and brewing his own. “With the skills I learned in the graphic design program, I can finally create labels to fit the beers I’ve brewed,” he said. When Desiree Salpietro-Gigl was a teenager, her grandmother thought she would do well as a children’s book illustrator. For her capstone project, Salpietro-Gigl, of Elmwood Park, decided to follow her grandmother’s advice, updating and illustrating a story she had written years ago about a couple of field mice that find a pie on a windowsill. After graduation, she plans to try to get the book published. The Fall Capstone Art Exhibition runs through Saturday, Dec. 15, in the Barbara A. Kieft Accelerator ArtSpace (200 W. Park Ave., Elmhurst). The Accelerator ArtSpace, built around a 20-foot-high particle accelerator dating back to the 1950s, is open on Tuesdays, Thursdays and Saturdays from noon to 4:00 p.m. Admission is free and the public is invited. This exhibition is one of about a dozen art shows that Elmhurst College hosts each academic year in two campus venues. The College also is home to an unparalleled collection of Chicago Imagist and Abstractionist Art, which explores the vibrant, often outrageous, yet precisely crafted works of Chicago artists between 1950 and the present. For more information, please contact Suellen Rocca at (630) 617-6110 or srocca@elmhurst.edu.